You can look at the statistics and averages but they don’t tell you anything about the quality of horses that were on offer. Without comment I will present to you in my own way the statistics and leave the judgement of the sale up to you. Learn more about pin bars by clicking here to get redirected on our website. According to the Landmark website the sale had a clearance rate of 74.45% with a sale average of $6,550.25. They have quoted the Led average at $5,425.74 and ridden average at $8,235. In having a closer look the mode average or should I say the most horses sold between the $3,000 and $4,000 mark. In fact 55% of the lots were dispersed for $5,000 or less. 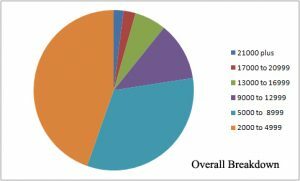 70.38% of all horses sold were dispersed at or below the mean average of $6,500. I’ve broken down this particular sale into six groups, Yearling Fillys, Yearling Colts, Yearling Geldings, Mares, Geldings and Stallions. 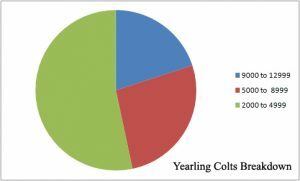 Yearling Colts had an 83.34% clearance rate with an average of $5,350. The Mode average was $2,000. 60% of these colts sold for $5,000 or less. 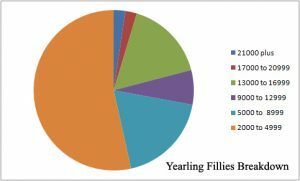 Yearling Fillys had a 79.63% clearance rate with an average of $6,790.70. The mode average was again $2,000 with 58% of the sales going for $5,000 or less. 67.44% sold around the mean average price of $6,700 or less. Yearling Geldings had a clearance rate of 82.35% and a mean average of $3,339.28. And once again the mode average was $2,000. With 82% of those that were cleared fetching $5,000 or less. 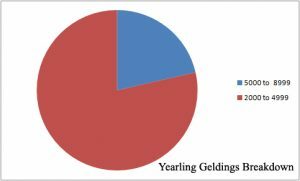 57% of the Yearling Geldings sold below the mean average price of $3,300. A total of 92 Mares were presented for auction this year with just over 76% of those being moved on. The mean average was $7,717.85 and the most common selling price for mares was $6,000. 39% of mares sold for $5,000 or less. Just under 65% of the mares sold under the mean average price of $7,700. That just leaves us with the Geldings and Stallions. There were only 6 Stallions offered and of those just 2 went under the hammer. With Graham Amos’s imported Stallion attracting a bid of $25,000. 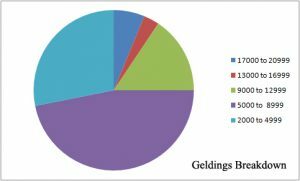 I havn’t included a graph for Stallions so we will move onto the final category, that being the geldings. 32 of the 47 Geldings that went into the sale ring sold at a clearance rate of 68% averaging $6,935.70. The Mode average was $5,000. 68.75% of those sold went for under the Mean Average price of $6,900 with 46.87% selling for $5,000 or less. As I said it’s hard to gauge how good the sale unless you witnessed the quality of stock on offer. If you missed out on what you were looking for at Toowoomba there are plenty of quality horses for sale in the Justcuttin’ Sale Barn.